I’m in a maximum-security prison, on a sparsely populated island in Denmark. The governor is leading me around, a big set of heavy-duty keys jangling on his belt. It’s important to clarify I haven’t committed a crime — I’m merely a visitor. But in this unusual Danish prison I’m beginning to think I wouldn’t mind staying after all. 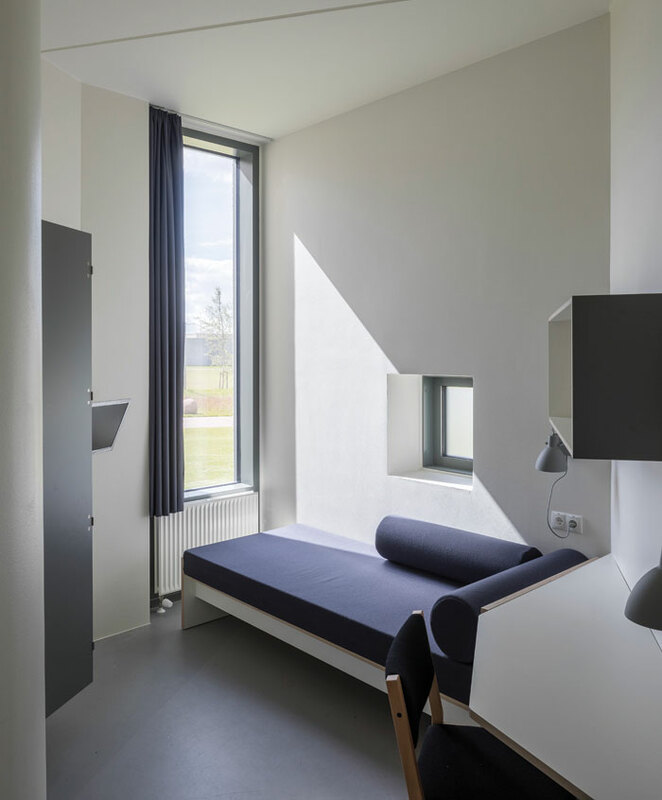 Storstrøm Prison, on the island of Falster — roughly 115km from Copenhagen — has been designed by Danish architecture practice CF Møller for the country’s Prison and Probation Service. Following a design competition in 2010, work started in 2012 and the 35,000 sq m complex opened late last year. 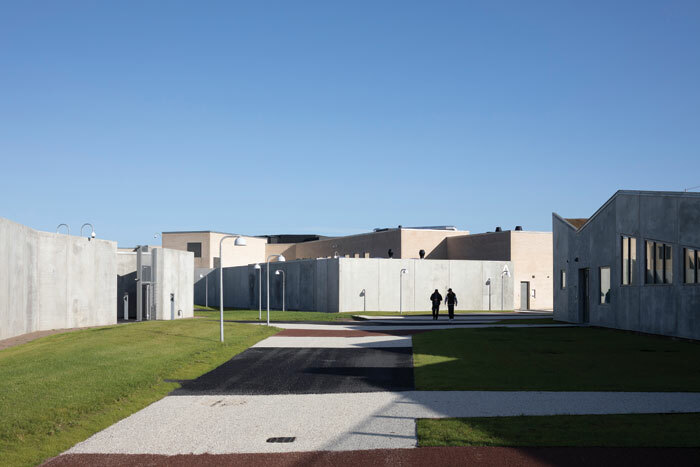 While this forms part of a larger project in which Denmark is renovating or rebuilding its prisons to make them more efficient and fit for contemporary use, in Storstrøm — a closed, Category 1 prison, the highest security level in Denmark — the design has focused primarily on wellbeing. Of staff, yes, but also — crucially — of inmates. This can be seen in the en-suite cells with tall, barless windows and flat-screen TVs, which look more like bright hotel rooms; in the verdant gardens designed by a landscape architect; and in the impressive sports and culture centre; and in the abundance of natural light the overall design brings in. Despite its thick concrete walls and 300 surveillance cameras, the whole complex is envisioned as a ‘village’. Though the layout takes its cue from the traditional panopticon idea of cells surrounding a central staff observation base, this has been dramatically modernised. In the middle of Storstrøm lies the main administration centre (also shared in part by inmates) and an ‘activity house’ — a circular building home to a church, multifaith prayer room, library, music room, healthcare unit, sports hall and ‘supermarket’. These buildings form the central hub, set in open, landscaped, communal space. From here, ‘streets’ fan out to the accommodation wards, of which there are five. Beyond, there is a seven-a-side football pitch and running track. With the sharp slopes of some rooflines and jagged articulations of ward floorplans, there is a geometry in the composition that brings an aesthetic liveliness and variety to disrupt potential monotony. Facade materials alternate between light-coloured brick and a combination of concrete and galvanised steel. The activity house has concrete and glass exterior panelling. One of the wards is protected by its own additional perimeter wall — as it is the highest-security ward within the maximum-security prison — but the other four are laid out identically to one another. 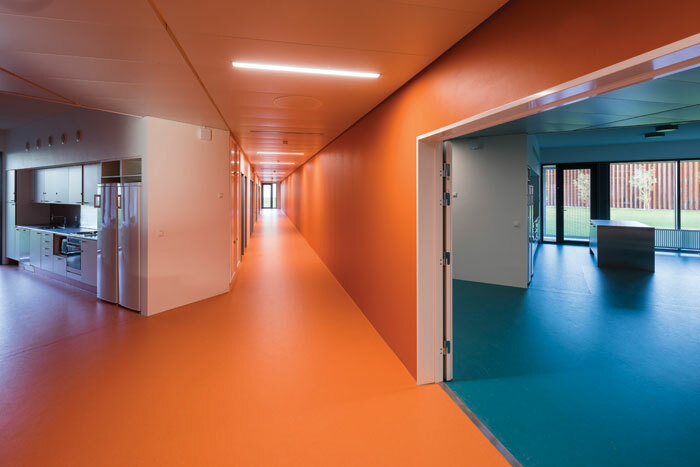 They accommodate four housing units each, with each unit containing four to seven cells arranged along a corridor, attached to a kitchen (where inmates cook their own food), outdoor smoking terrace, fitness room and indoor communal area (hosting ping pong tables or sofas). Each of these housing units is visually marked out by a different bold colour — orange, blue, yellow, green — which saturates the space (perhaps too much at times: the orange unit feels uneasy and overwhelming). Each 13 sq m cell (there are 250 in total) looks like a bedroom plucked from an IKEA catalogue. It contains a black sofa bed, mini fridge, flat-screen TV, desk, reading lamps, shelving and cupboards. 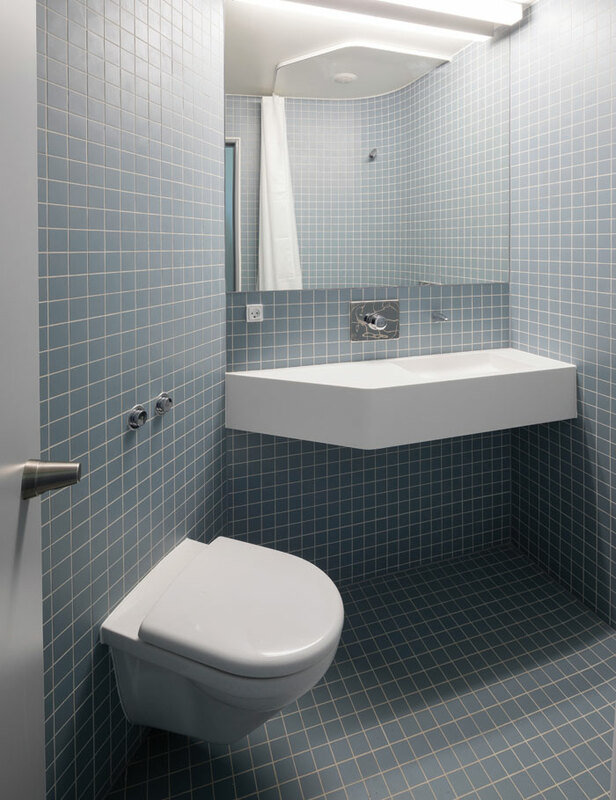 There’s an en-suite bathroom, clad completely in blue ceramic tiles. Most strikingly, there is a large, 3.1m-high, barless window overlooking the bed, flooding the room with natural light — identified as vital for wellbeing. The rest of the ward is taken up by staff facilities, a walled outdoor recreation space, and workshops. The outdoor recreation area is landscaped, with sports equipment, seating, greenery and a sheltered area. The workshops, however, steal the show. Two large concrete spaces — one bigger than the other with a lofty sloped ceiling — they are the sorts of spaces that artists and makers yearn for. While the raw concrete gives an industrial feel, the prison will invite inmates to paint the walls if they wish — and even create murals. Welding and carpentry will also take place in these workshops, including the production of furniture to be used across Danish prisons. It is in these spaces that many of the inmates will spend what is essentially a working day. Inmates must be ‘occupied’ for 37 hours a week; for this they receive wages (including sick pay). While the majority of this occupation is based around the workshop, alternative accepted activities include education and rehabilitative treatment programmes. As far as possible, inmates undertake skills-building activities to help them qualify for work after being released, whether that be carpentry and welding, or food preparation (some inmates are employed to work in the kitchen that prepares food for the staff restaurant). In addition to this there is of course leisure time, much of which will be spent in the aptly named ‘activity house’, which feels like a sports and culture building you might find at a high-end secondary school. 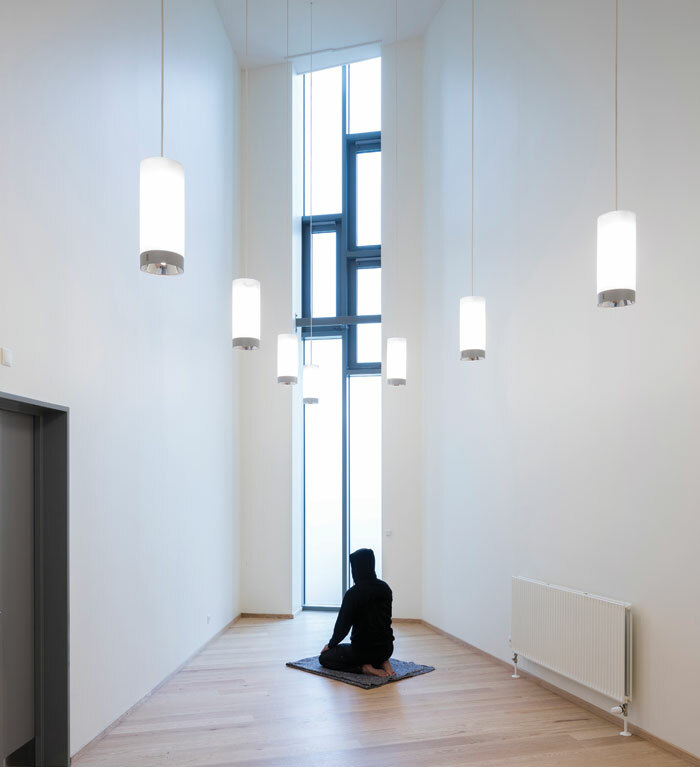 In spaces such as the music room (‘for band practice’, the governor says) and the multifaith prayer room, ceilings are impressively high, with full-length windows (facing towards Mecca in the prayer room). Elegant pendant lamps provide softly glowing, not brash, illumination. 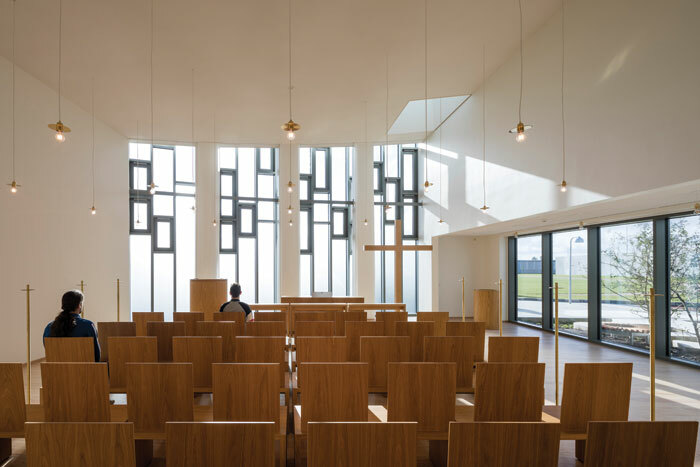 The church — envisioned as an entire community hub with an entrance space for gatherings, harnesses an abundance of oak, along with brass detailing, to create an area of warmth, beauty and calm bathed in natural light. The multifunctional sports hall is huge at 660 sq m. Across the length of one wall is one of the prison’s two commissioned artworks: a gigantic seascape painting by John Kørner (‘the biggest painting in Europe’, says the governor). 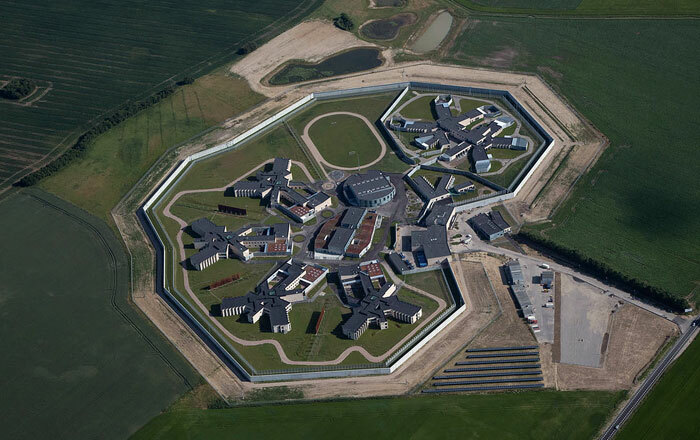 In fact, the Danish government stipulates that 1.5% of the building costs of any public project should be set aside for art — even in prisons such as this. In addition to the Kørner painting, there is a patinated bronze sculpture group by Claus Carstensen. Located in the central courtyard near the gateway building (the prison entrance), it depicts a life-size group of five men standing around, seemingly aimlessly. Time will tell how the prisoners will interact with these bronze men. Nearby is the main administration centre, in the middle of the complex. Inside, corridors with pitched ceilings — with a repetitive, almost zig-zag, form — contain skylights that allow powerful shafts of daylight into the space. 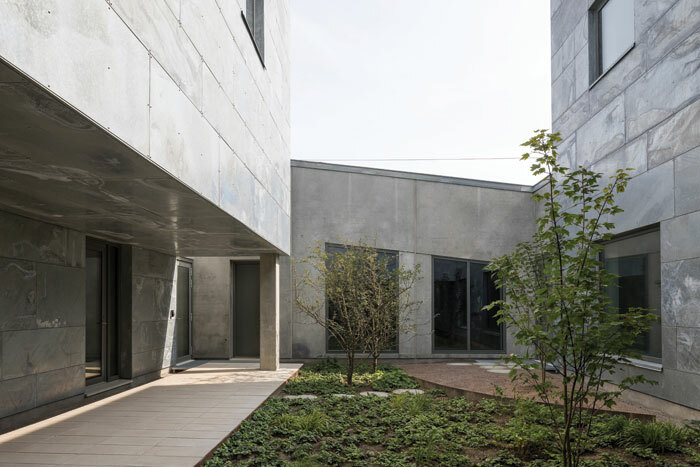 There is a peaceful courtyard garden, accessible to both staff and inmates, which feels inspired both by traditional Japanese garden design and Peter Zumthor’s raw minimalism. The hue of concrete and sheen of galvanised steel interact with the gentle shimmer of leaves on the young trees within. 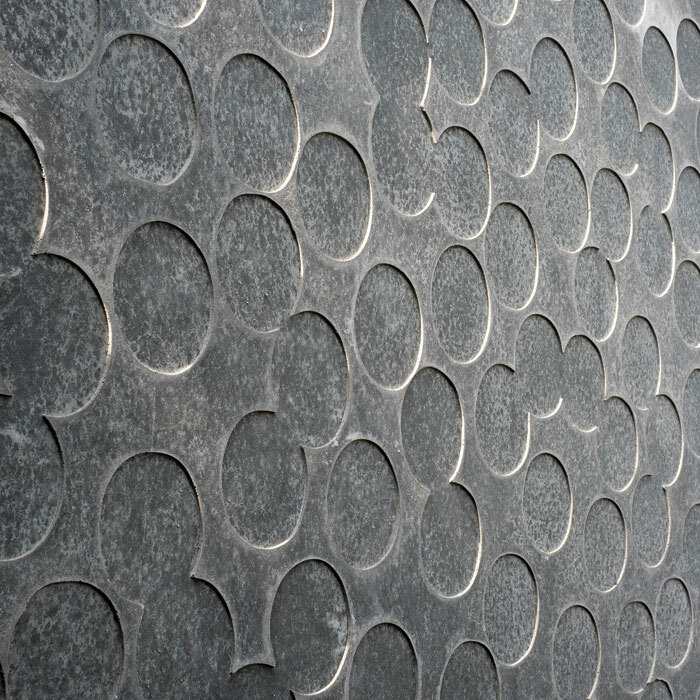 The facade of the administration building features a pattern relief of repeated circles, reminiscent of bubbles. This design was created by sub-contracted practice Aggebo & Henriksen Design (also responsible for the block colour usage in the housing units); this circle-based pattern is also found on the walls of the outdoor recreation spaces in the maximum security ward, adding a flourish of decoration. This motif of repeated circles was also picked up by the project’s landscape architect, Marianne Levinsen, with bubble-like circular mounds of grass in the outdoor landscaped area surrounding the activity house, which she describes as the ‘village public square’. In addition to these grassy mounds there are benches and trees to create, as Levinsen explains, a ‘more humane environment’. Levinsen, who worked closely alongside CF Møller, also inroduced small lawns up against the building facades to maintain privacy and worked to make the inner recreation areas as green as possible in order to enhance wellbeing. She introduced a kitchen garden, where inmates can grow their own vegetables to cook, and a garden attached to the church created as ‘an inviting space for contemplation and reflection’. Levinsen faced her fair share of challenges: not only did her design have to adhere to the prison’s restrictions — an original lake and group of trees were removed for security reasons; an apple orchard was scrapped due to financial limitations — but she also had to deal with the exceptionally wet ground on the low-lying island. 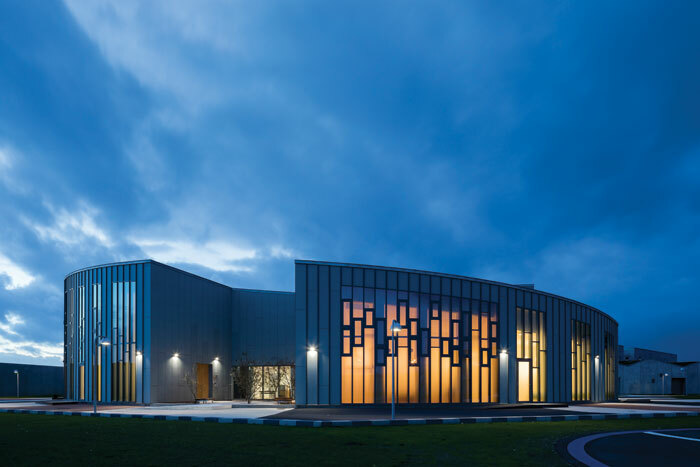 A visitor centre, located between the ‘village hub’ and the gateway building, is specifically designed to help support the inmates’ relationships with their families. There are individual visiting rooms each with an en-suite bathroom and small outside area, as well as a family common room — containing bamboo seating and shelving, packed with children’s toys — and an impressive outdoor playground. Most surprisingly, however, are the three visitor flats. These have been created so that prisoners can enjoy weekend-long visits from their families. From Friday evening to Sunday night, they are able to move into one of these two-bedroom, one-kitchen, one-bathroom, fully fitted-out flats — decorated quite literally with furniture from IKEA, as well as pot plants, picture frames and children’s toys — in order to spend quality family time together in as normal a setting as possible. There is even a small landscaped garden — it feels like an actual home. Wandering around the well-equipped, beautifully designed spaces — the kind of environment many people in social housing don’t even have — it is hard not to wonder about the inherent contradiction between ‘wellbeing’ and ‘punishment’. Sten Osenfeld from Alex Poulsen Arkitekter, project manager for the Danish Prison and Probation Service on Storstrøm, reflects on this before replying. ‘In Denmark, punishment is not about the place,’ he explains. ‘It is about the lack of freedom.’ What’s more, the policy of the Danish Prison and Probation Service, in the overall aim to reduce criminality, is to motivate offenders to become law-abiding citizens, rather than punish them for not being so. ‘We want to make the environment as similar to the outside world as possible,’ explains Osenfeld, ‘to make the return to normal life easy to process.’ There is a focus on the inmates being largely self-sufficient: they use the wages they earn to buy food and items from the supermarket, which they then cook themselves. They also do their own washing up and laundry, embedding a sense of responsibility and normality. CF Møller, for its vision, has interpreted this approach as ‘architecture that stimulates inmates’ desire and capacity to rejoin society after serving a prison sentence.’ In this way it is a form of rehabilitative architecture more commonly associated with hospitals and treatment centres. 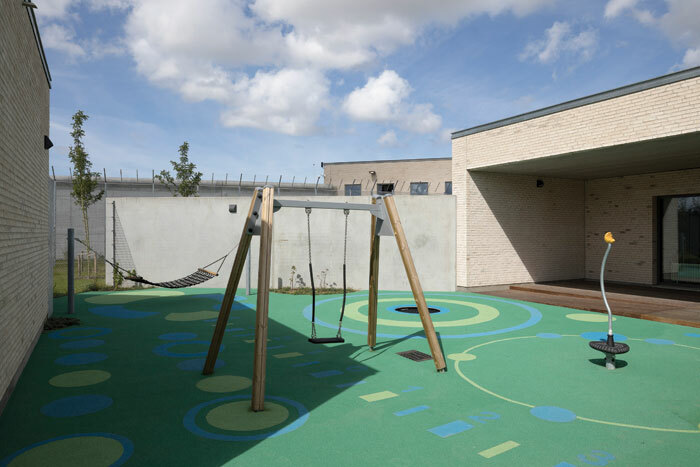 The architects describe the strong focus on integrating ‘stimulating and healing aspects’ as the belief that this kind of setting can have a beneficial effect on the rehabilitative task of the prison. 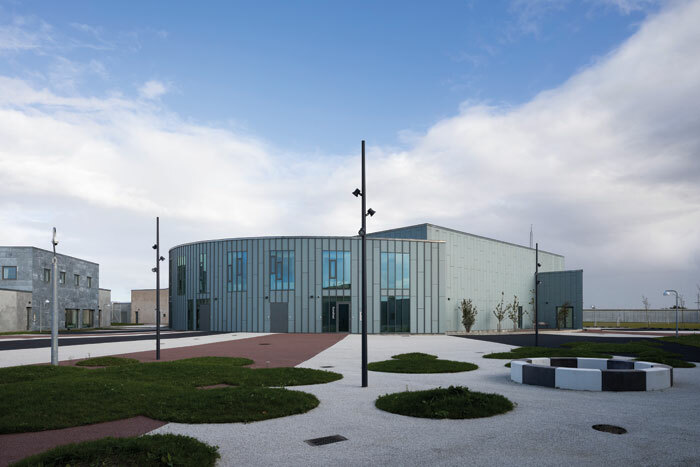 It will be interesting to see whether this humanisation of prison design proves ultimately more successful at rehabilitating offenders and, as the Danish prison service states, encouraging them to become law-abiding citizens. A background concern lingers, though, that there is a risk in making a prison environment so pleasant it becomes appealing. It may take years to evaluate the impact of such design, but it is certainly a step forward in a new direction, and one that looks set to be adopted beyond the boundaries of typically progressive Denmark. 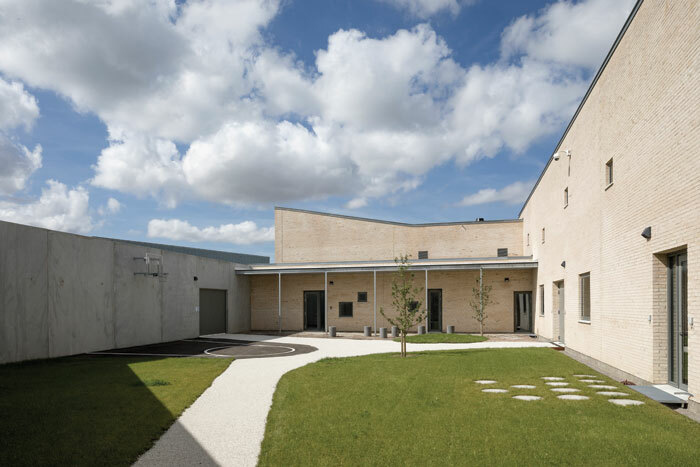 A UK report published in December by Matter Architecture, working in liaison with the Ministry of Justice Prison Estate Transformation Programme, recommends that future prisons ‘should be designed to support staff and prisoner wellbeing’. Wellbeing in Prison Design sets out a series of practical design principles, arguing that the way in which past prisons have been commissioned and built has proved to be a barrier to rehabilitation and the welfare of the workforce. You heard it here first: wellbeing in prisons is coming to a town near you soon. But be warned — you may have to commit a crime to experience it for yourself.